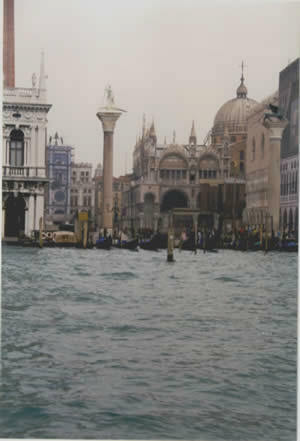 Learn about Venice, Italy, by reading Venice is for Lovers by Gary W. Bloom, WTA Member and Leisure Traveler/Writer. It features a mini, but thorough tour of the destination, plus all you'll need to know to plan your trip including how to get there, objective information on places to stay and eat, and things to do. At the end of the article, we've provided a summary of the contact information for your easy reference. Enjoy! A nighttime view of Venice’s Grand Canal. There are few places in the world with the romantic allure of Venice. The birthplace of Giovanni Casanova, there must be something in the water that makes people fall in love. And there’s water everywhere. 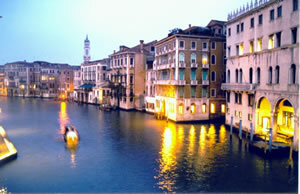 There are 118 islets, 150 canals and 409 bridges in Venice. You’re not even safe on land, with the frequent flooding of its piazzas and the seemingly constant light drizzle that makes one want to snuggle up in a small cafe, or simply stay in bed in a centuries old hotel. Lying in a 25-mile long salt-water lagoon, deposits of silt have built up over thousands of years to form the islands of what is now Venice. This most impractical of cities has survived the onslaught of water and tourists for 1,600 years. It is a fairytale town of gondolas, palaces, sidewalk cafes, and quaint squares. The Pearl of the Adriatic, Venice is not a historic city turned into a theme park. It is still a working city with homes that are hundreds of years old, still lived in by generations of families that have been here for hundreds of years. The best thing about Venice? There are no cars, no buses, no Vespas. In their place are gondolas, water taxis, fire boats, garbage boats, and even hearse boats. While I was walking near one canal, an ambulance boat came cruising up, lights flashing and sirens blaring. An elderly woman was carefully lifted into the boat on a stretcher, and the ambulance sped away. I was left with the impression of just how well this city has adapted to its unusual geography. It is impossible not to get lost in Venice, and impossible not to find your way back. After all, there’s only so far you can walk on a small island. A labyrinth of narrow roads, passageways, and canals lead to surprises around every turn. Venice’s main street is the Grand Canal, lined with nearly 200 equally grand palaces. Getting around Venice is easier than one might think. The “vaparetto” are Venice’s public transportation. These long, narrow boats are the public busses of the waterways. They’re an efficient and inexpensive way to leapfrog surrounding islands. The sleek mahogany water taxies, while convenient, are expensive. And for the hopelessly romantic, there are the gondolas, which charge prices that are anything but romantic. There is really only one piazza in Venice - the San Marco. It is the heart of Venice, a big heart the size of a couple of football fields. It is anchored at one end by Florian’s and at the other by Caffe Quadri. These two elegant cafes, complete with dueling orchestras, have been a meeting place for artists, writers, and lovers for centuries. Piazza San Marco, as Napoleon so eloquently put it, is the drawing room of Europe. Locals and tourists come here to eat, drink, see and be seen. Early in the morning is the best time to wander the Piazza without feeling like you’re actually in a football stadium. Like most of Venice, the piazza is occasionally under water, which is either charming or disgusting, depending on your frame of mind. Near the San Marco are two of Venice’s most important buildings. The Basilica di San Marco has been the spiritual center of Venice since 830 AD. A law passed in 1075 required all returning ships to bring back a precious gift to decorate the Basilica. The building is an eclectic mixture of architectural styles and is an important work of art in its own right. The Doge’s Palace, built during the 14th century, was the center of government for the Republic. The Bridge of Sighs connects the Palace with the infamous prison where the inquisitors interrogated suspects with the aid of red-hot pincers and the “rack.” The Armory has over 2,200 weapons and suits of armor on display. Tintorello’s “Paradise,” the largest oil painting in the world, is displayed in the Hall of the Great Council. There are many other squares to explore, some postage stamp sized and others large enough to host a neighborhood soccer game. The campi, as the squares are called, each have their own personality, and walking the dark narrow paths of Venice, they provide a welcome resting place, surrounded by restaurants, bars, and cafes. A city as beautiful, romantic, and unique as Venice has been a magnate for writers and artists for centuries. Some were homegrown, while others trekked to the city for inspiration. Hemingway, Vivaldi, Thomas Mann, Titian, Lord Byron, Richard Wagner, Mark Twin, Anton Chekhav, Gore Vidal – the list goes on and on. It’s ironic that Shakespeare, who by all accounts never visited the city, wrote one of the most famous works with a Venice imprumpeteur, “The Merchant of Venice.” But other writers had first hand experience. William Dean Howells’ Venetian Life is one of the best books about Venice. Hemingway’s Across the River and Into the Trees is a love story about an American and a Venetian countess. And Thomas Mann’s famous novel, Death in Venice, was set on the nearby island of Lido. A view of Venice’s amazing architecture from the Grand Canal. Many of the islands of Venice have specialized in a particular craft or service. Think of them as boutiques surrounded by water. Murano is the place to go to buy glass works, as well as to visit Italy’s only glass museum. If you’re into lace, you’ll want to catch a water taxi to Burano. The Museum of Lace is located on this island, tracing the history of the craft that originated in Venice in the 15th century. Burano is also known for its kaleidoscope of colorful pastel homes that line the canals. There’s also the cemetery island, San Michele, where a premium on space requires burial plots to be re-used after 12 years. If the cemetery island is too depressing, visit the Lido, a 7-mile long island of fun and sun, with beaches, a casino, golf course, and other attractions for the tan and trendy. Venice is a work of art in marble, velvet, and lace. As Truman Capote said, “Venice is like eating an entire box of chocolate liqueurs in one go.” A flaming, flamboyant city that has seduced lovers for centuries. This is where newlyweds go for their honeymoon, and others for discreet and not so discreet romances. Casanova, probably the most famous of Venice’s philanderers, was born here in 1725. He was on his way to an unlikely career as a priest when he was expelled from the seminary for immorality. In what was to become a pattern, he was later expelled from all of Venice. He then began a spiritual journey of a different sort that took him across Europe, earning his living as a gambler, writer, sometime spy, and always as a lover and seducer of women. His name lives on here, perhaps as the person who epitomizes the Venetian’s lazzei faire attitude toward love and marriage. There are not many limits to those seeking love in Venice. But the summer may be one of them. The hot months turn the lovely canals into a smelly cauldron, and the crowds of tourists turn the romantic city into a zoo. Better to visit during the off-season. Although temperatures can get down into the 30’s during the winter, it is well worth the discomfort not to have to share this fairytale city. Venice’s Marco Polo Airport is located about 5 miles north of the city. Airlines offering service from the U.S. to Venice include Delta and Alitalia Airlines, which have direct flights, and Lufthansa, Air France, British Airways, United, Continental, KLM, American, Scandinavian, Austrian, Northwest, and Iberia Airlines with connecting flights. As of May 2004, round-trip airfare from the U.S. could be found for around $600. There are bus and water taxi shuttles from the airport to Venice. A water taxi from the airport to your hotel will run about $100, but the ATVO fly bus to Piazzale Roma is only about $3.60. Another alternative is the Alilaguna waterbus (http://www.alilaguna.it), which takes you to Venice’s St. Mark’s Square and other stops for about $12. Trains arrive at Venezia Santa Lucia station, at the head of the Grand Canal. There are public water buses and water taxis nearby, but if your hotel is not far from the station and you don’t have too much luggage, you may be able to walk. The Cipriani is one of Venice’s most expensive hotels, and one of the world’s best. It’s built on three-acres on the tip of Giudecca Island, just minutes by boat from Piazza San Marco. It’s a quiet oasis from the noise and crowds of Venice. The hotel has an Olympic sized pool, fitness center, and Jacuzzis in some of the rooms, with views of the lagoon, Palladian Church of San Giorgio Maggiore, or the gardens and vineyards. Book rooms on their website, for around $800 per night. In a quiet district close to the Accademia Gallery, this charming 17th century hotel once housed the Russian Embassy. Furnished with antiques and with a garden overlooking the Grand Canal, it is moderately priced at around $160 for doubles. Near San Marco Square, and the Rialto Bridge, this small hotel has simple rooms that are reasonably priced. Doubles go for about $130 including breakfast. This is the place to go for seafood. A cozy restaurant in a 300-year old building that gets its name from “furatolas,” the small shops in Venice’s early years that served seafarers. Today, it’s more likely to be filled with local residents who know a bargain, serving marinated and boiled seafood antipasti at prices of around $20. It’s hard to find, so bring a good map. A legendary bar and restaurant, opened in 1931 and a favorite of Ernest Hemingway, this is the place to see and be seen in Venice, with prices to match. Perhaps better known for its ambience and drinks than its food, it still offers some notable dishes, including its famous Carpaccio of beef, a plate of wafer thin sliced sirloin. Its even more famous drink is the Bellini, a mixture of white peach juice and sparkling prosecco. Prices are in the expensive range, with entrees around $40. You’ll need a map to find it and reservations to get in, but da Fiore has been acclaimed as one of the best restaurants not just in Venice, but also in the world. Such notoriety doesn’t come cheap. Dinner will set you back about $90. Reservations can be made on their website, and should be made well in advance. Venice has a mild climate and the weather is relatively pleasant throughout the year, though winters can be cold and damp. Like most of Europe, late summer is the busiest when everyone is on holiday. During the spring and fall the weather is pleasant, there are fewer crowds and hotel prices tend to be lower. Walking is the best way to see this compact city; just be resigned to the fact that you’ll probably get lost in the labyrinth of alleys and canals. The vaporettoi, Venice’s public boat transportation, is a fun and inexpensive way to see Venice’s many islands. Depending on how long you’re staying, buy a 24 hour, 72 hour, or one week pass. The sleek, polished mahogany water taxis are very expensive, at about $40 for a short ride, though you may be able to negotiate. If you have a lot of luggage and your hotel is not easily reached by foot, you may have to opt for a water taxi. Italy, like most of Europe, now uses the Euro as its currency. The U.S. dollar has declined against the Euro recently, and prices have been rising accordingly. As of April 2004, one USD was equal to about .82 Euro. Hours: 9am – 7pm daily April – October; 9am – 5pm daily November - March. Once the home of the doge, the elected-for-life leader, the Palace is connected to the infamous prisons over the Bridge of Sighs. The doge could sentence, torture, and imprison people all in the confines of his home. You’ll especially want to see the prisoner cell blocks, the Bridge of Sighs, and the Armory. To really understand what you’re seeing, you might want to get an audio guide at the entrance for about $5. Hours: April through September: Monday - Saturday 9:45am - 5:00pm, Sunday 2 - 5:00pm, October through March: Monday - Saturday 10am - 4:00pm, Sunday 2 - 4:00pm. (Check web site for treasury and museum hours). Entrance Fee: Free for the Basilica, about $3 for the treasury and about $2 for the Marciano Museum. St. Mark’s Basilica, one of the world’s greatest churches, has housed the body of St. Mark since about 832. The Treasury contains the goblets, chalices, and other precious items that were looted from the city of Constantinople. The Marciano Museum is famous for the four bronze horses that are the only surviving quartet of yoked horses to have survived from the 4th century. Note: you must be dressed appropriately to enter the basilica – no bare knees or shoulders. Hours: Monday-Friday 8:45 am-1:30pm; Saturday 8:45am-1pm. Part of the imposing Arsenale, the Naval Museum is a one of the best bargains in Venice. The museum has displays of Italian navy uniforms and weapons, along with gondolas and other boats. An especially interesting museum for kids, and anyone interested in maritime history. Notice: This information is current as of April 2004. It is recommended that you contact the numbers, and/or visit the websites above to determine any changes to the information.